On my wall in London is my favourite photograph from South Africa. 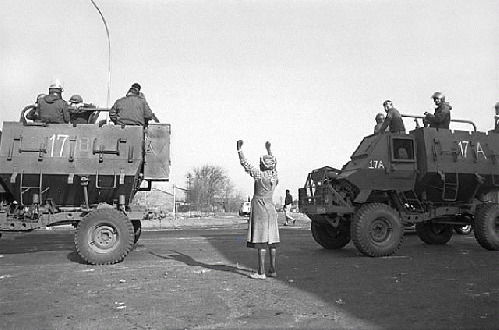 Always thrilling to behold, it is Paul Weinberg's image of a lone woman standing between two armoured vehicles, the infamous "hippos," as they rolled into Soweto. Her arms are raised, fists clenched, her thin body both beckoning and defiant of the enemy. It was May Day 1985; the last great uprising against apartheid had begun. Twelve years later, with my 30-year banning from South Africa lifted, there was a pinch-me moment as I flew into Jan Smuts and handed my passport to a black immigration officer. "Welcome to our country," she said. I quickly discovered that much of the spirit of resistance embodied in the courageous woman in Soweto had survived, together with a vibrant ubuntu that drew together African humanity, generosity and political ingenuity -- for example, in the dignified resolve of those I watched form a human wall around the house of a widow threatened with disconnection of her electricity, and in people's rejection of demeaning "RDP houses" they called "kennels"; and in the pulsating mass demonstrations of social movements that are among the most sophisticated and dynamic in the world. On the twentieth anniversary of the first democratic vote on 27 April 1994, it is this resistance, this force for justice and real democratic progress, that should be celebrated, while its betrayal and squandering should be understood and acted upon. On 11 February, 1990, Nelson Mandela stepped out on the balcony of Cape Town City Hall with the miners' leader Cyril Ramaphosa supporting him. Free at last, he spoke to millions in South Africa and around the world. This was the moment, an historic split-second as rare and potent as any in the universal struggle for freedom. Moral power and the power for justice could triumph over anything, any orthodoxy, it seemed. "Now is the time to intensify the struggle," said Mandela in a proud and angry speech, perhaps his best, or the last of his best. The next day he appeared to correct himself. Majority rule would not make blacks "dominant." The retreat quickened. There would be no public ownership of the mines, banks and rapacious monopoly industries, no economic democracy, as he had pledged with the words: "a change or modification of our views in this regard is inconceivable." Reassuring the white establishment and its foreign business allies -- the very orthodoxy and cronyism that had built, maintained and reinforced fascist apartheid -- became the political agenda of the "new" South Africa. Secret deals facilitated this. In 1985, apartheid had suffered two disasters: the Johannesburg stock market crashed and the regime defaulted on its mounting foreign debt. In September that year, a group led by Gavin Relly, chairman of the Anglo-American Corporation, met Oliver Tambo, the ANC president, and other liberation officials in Mfuwe, Zambia. The Relly message was that a "transition" from apartheid to a black-governed electoral democracy was possible only if "order" and "stability" were guaranteed. This was liberal code for a capitalist state in which social and economic democracy would never be a priority. The aim was to split the ANC between the "moderates" they could "do business with" (Tambo, Mandela and Thabo Mbeki) and the majority who made up the United Democratic Front and were fighting in the streets. The betrayal of the UDF and its most effective components, such as the National Civic Organisation, is today poignant, secret history. In 1987 and 1990, ANC officials led by Mbeki met 20 prominent members of the Afrikaner elite at a stately home near Bath, in England. Around the fireplace at Mells Park House, they drank vintage wine and malt whisky. They joked about eating "illegal" South African grapes, then subject to a worldwide boycott, "It's a civilised world there," recalled Mof Terreblanche, a stockbroker and pal of F.W. De Klerk. 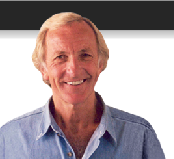 "If you have a drink with somebody ... and have another drink, it brings understanding. Really, we became friends." So secret were these convivial meetings that none but a select few in the ANC knew about them. The prime movers were those who had profited from apartheid, such as the British mining giant Consolidated Goldfields, which picked up the tab at Mells Park House. The most important item around the fireplace was who would control the economic system behind the facade of "democracy." At the same time, Mandela was conducting his own secret negotiations in Pollsmoor Prison. His principal contact was Neil Barnard, an apartheid true believer who headed the National Intelligence Service. Confidences were exchanged; reassurances were sought. Mandela phoned P.W. Botha on the his birthday; the Groot Krokodil invited him to tea and, as Mandela noted, even poured the tea for his prisoner. "I came out feeling," said Mandela, "that I had met a creative, warm head of state who treated me with all the respect and dignity I could expect." This was the man who, like Verwoerd and Vorster before him, had sent a whole African nation to a vicious gulag that was hidden from the rest of the world. Most of the victims were denied justice and restitution for this epic crime of apartheid. Almost all the verkramptes -- extremists like the "creative, warm" Botha -- escaped justice. How ironic that it was Botha in the 1980s -- well ahead of the ANC a decade later -- who dismantled the scaffolding of racial apartheid and, crucially, promoted a rich black class that would play the role of which Frantz Fanon had warned -- as a "transmission line between the nation and a capitalism, rampant though camouflaged." In the 1980s, magazines like Ebony, Tribute and Enterprise celebrated the "aspirations" of a black bourgeoisie whose two-garage Soweto homes were included on tours for foreigners the regime sought to impress. "This is our black middle class," the guides would say; but there was no middle: merely a buffer class being prepared, as Fanon wrote, for "its historic mission." This is unchanged today. The Botha regime even offered black businessmen generous loans from the Industrial Development Corporation. This allowed them to set up companies outside the "bantustans." In this way, a black company such as New Africa Investments could buy part of Metropolitan Life. Within a decade, Cyril Ramaphosa was deputy chairman of what was effectively a creation of apartheid. He is today one of the richest men in the world.